Yesterday I slotted two dulcimer fingerboards. The top fingerboard is zircote and the bottom is bubinga. Zircote has many of the qualities of ebony but it is lighter in weight, which in my opinion is a good thing. Zircote also has wild, lacy figure and color streaks I find stunning. I rarely use zircote for fingerboards because it is hard to find quarter-sawn zircote in the dimensions I require. After making this fingerboard I have enough zircote left for one more fingerboard, possibly two if the bandsaw Gods are kind when I resaw it. 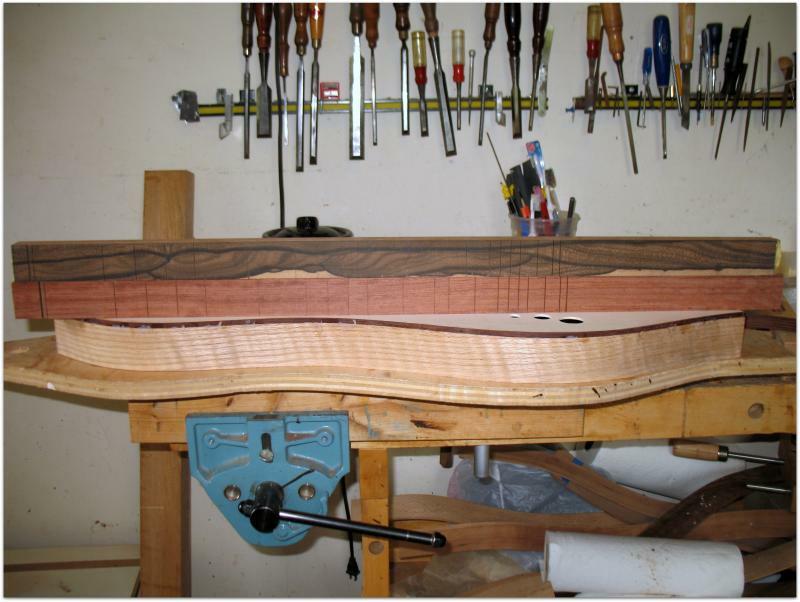 The bottom fingerboard is bubinga. Anything quarter-sawn from the rosewood family, including similar woods that are not technically rosewood but close enough, almost always works well as fingerboards, at least for me. If they are well quartered, stiff and relatively light I am happy. In general I am more concerned with the qualities of a piece of wood than it’s species. The zircote fingerboard will go on a dulcimer with a sassafras top and curly walnut back and sides, the bubinga fingerboard will go on the dulcimer in photograph, quartered oak with some flame figure and a spruce top. Boring health issues currently keep me from working as much as I prefer, though I am happy and thankful for every moment I can work in what my wife calls “Doug’s playroom.” I love my job. Two other dulcimers are nearly ready for sale; one in walnut, one in cherry. I’ll be posting them in the next week or so.